If your Facia / Soffitts / Barge Boards or Guttering are rotten or needs replacing then Pegasus is the company to chose. 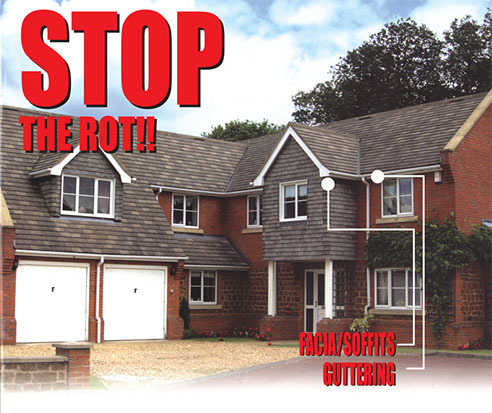 All Facia and soffitt products are Replacement 20mm products – we do NOT cap over existing. If any bad rafter feet are found, we will cut back and plant new rafter feet onto existing. If cement verges are defective we will replace. An Eaves protection system is used to allow water to flow directly into gutter and to mask the gap between Facia and gutter. This goes under existing roofing felt and on top of Facia. A bird comb is used on top of Facia if tiles are contoured so as to stop unwanted guests from nesting. Where ever there is gutter we use a ventilated soffitt board to allow roof to breathe along gable ends a solid is used. All boards are fixed with stainless steel pins. Gutters can be either square line or round line and come in the colours of Black or White. Brown or Grey gutter is also available but only in round line. All products are guaranteed for 10 years.